Lindiwe Matlali of Africa Teen Geeks, Ashlene Van Der Colff of MMI Holdings and Samantha Perry of Women in Tech ZA. Africa Teen Geeks (ATG), in partnership with the Gauteng department of basic education, will be piloting a mechatronics, coding and robotics initiative in Tshwane schools from January 2019. Africa Teen Geeks founder Lindiwe Matlali said the organisation had partnered with the education department to advance the programme. "We are working with the Tshwane district to pilot the programme before venturing into other districts and provinces. "At present we are training teachers, a task Oracle is helping us to achieve. They are training teachers in five provinces to make sure that by the time we start the roll-out process, we have a big enough pool of qualified teachers who can teach the content." Matlali made the announcement at a Women in Tech ZA conference in Centurion, Gauteng on Friday. 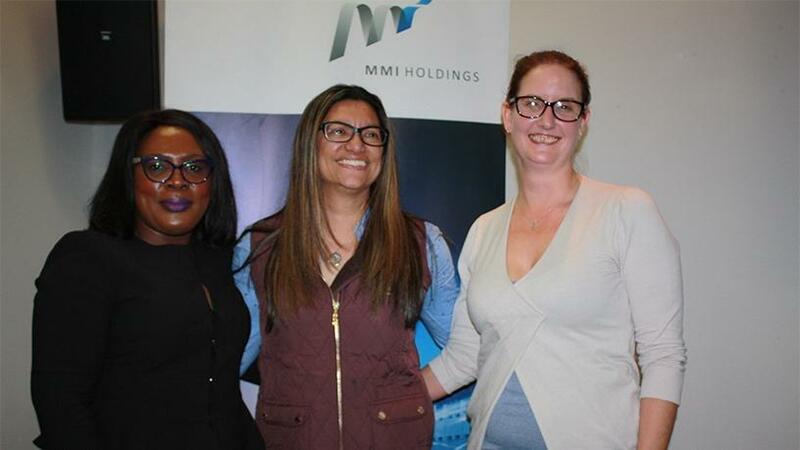 The Women in Tech ZA Forum, held in conjunction with MMI Holdings, is a a networking event that aims to address the gender gap in IT and bring together women in the ICT sector. The pool of teachers selected for training was not limited to STEM (science, technology, engineering and mathematics) educators, but also included teachers who showed interest in the field. "We were only looking for a coalition of the winning teachers who are passionate and have a vested interest in the subject. The teachers do not need to be technical, they just need to understand how they can teach the subject and deliver the content, and in so doing allow the kids to be more innovative." Mechatronics is a multidisciplinary field of science that combines mechanical engineering, electronics, computer engineering, telecommunications engineering, systems engineering and control engineering. "We wanted to focus on the E in STEM education which stands for engineering, because when you teach that, you enable kids to invent and physically make stuff. This will also curb the crisis we face where parts and hardware for tech devices are imported instead of being produced locally." Matlali announced that the non-profit organisation has also partnered with the SABC Foundation and Ikusasa LeAfrica Foundation to launch the #GirlGeekCampaign, an all-girl initiative aimed at equipping young girls with ITC skills and creating a pipeline of African women in tech. According to the Women in Business: New perspectives on risk and reward report, only 23% of tech jobs are held by women in SA. Women occupy only 56 000 out of 236 000 ICT (tech) roles. "ICT is at the forefront of global innovation today, reshaping almost every aspect of our lives for the better, but it has a serious diversity problem. Female representation in South Africa's tech industry is as low as 20%, but there is a growing drive to challenge the status quo and introduce women to the world of coding. "The aim of this initiative is to inspire young girls to pursue tech careers, creating a pipeline of African women in tech. "Only 23% of girls take IT as a subject in Grade 10. So far only 5% of our schools teach IT, and this is mostly affluent schools. We are changing this by exposing disadvantaged girls to computer science through our Saturday and holiday classes. "We want girls to feel like they belong in tech by instilling them with a sense of appreciation that being a girl geek is cool." Girls between aged between nine and 18 years old will be selected to be part of the programme, where they will learn about robotics, how to build Web sites and other technologies. "We delighted by this partnership with ATG as we are able to provide much-needed skills to young girls, to enable them to also benefit from opportunities for women in technology," noted Iris Cupido, CEO SABC Foundation.